THE BOARD of Poetry Ireland recently announced Ms. Maureen Kennelly as the new Director of Poetry Ireland. According to Poetry Ireland’s press release on the new appointment, Ms. Kennelly was Primary Curator with the Mountains to Sea DLR Book Festival for 2012 and 2013, Programme Director of the Cúirt International Festival of Literature, Galway for 2009 and 2010 and curator of the All- Ireland Performing Arts Conferences held in Belfast and in Derry for the past two years. Ms. Kennelly was previously director of Kilkenny Arts Festival, artistic director of the Mermaid Arts Centre, Bray, and she has also worked with Fishamble New Writing Theatre Company, Druid Theatre Company, The Arts Council/An Chomhairle Ealaíon and the Irish Youth Choir. Suffice to say that Ms. Kennelly is a heavy- hitter; her impeccable record and wide- ranging experience in arts management speaks entirely for itself. In Poetry Ireland’s 35th year, it will be interesting to see what changes and innovations Poetry Ireland’s new Director will introduce ahead of the organisation’s 40th anniversary in 2018. Allow me to preface my list of suggestions by clearly stating that I am not commenting as someone who thinks he knows better than Ms. Kennelly, or anyone else involved in Poetry Ireland, for that matter; I am simply commenting as someone who, like any Irish tax- payer reading this opinion piece, indirectly funds Poetry Ireland, which both receives and relies on generous financial support from both The Arts Council of Ireland and The Arts Council of Northern Ireland. The suggestions below come from someone who reads poetry voraciously, buys dozens of poetry books during the year and writes about poetry in print and online media. My suggestions come with good intentions and I wish Ms. Kennelly, who I think will be a great Director, every success in the post. As a national organisation for poetry, Poetry Ireland has always lacked a comprehensive online hub that leaves it behind The Poetry Society and, though an independent literary organisation, far behind The Poetry Foundation, the Chicago- based publisher of Poetry. The Poetry Foundation’s website is one of the most complete online resources for anyone interested in poetry. Featuring detailed profiles of poets and some of their poems online, complete with sound archives of poets reading their poems and an archive of any poems and essays which that poet may have had published in Poetry, The Poetry Foundation’s site has the same scope as The Poetry Archive, which was the crowning achievement of Andrew Motion’s tenure as poet laureate of Britain. For anyone outside of Ireland wanting to know more about contemporary Irish poets, there’s little in the way of a starting point. A full, complete, comprehensive online archive could, at the very least, give the first rung on the ladder for curious readers. The good news? Poetry Ireland have made recent efforts to archive previous editions of Poetry Ireland Review (Poetry Ireland uploaded issues 1 – 30 on Poetry Ireland’s website), though it still has some way to go. Another idea for bringing the organisation into the modern age would be an iPhone / Android app, reminding users of competition deadlines and readings / launches / events that are on during the week. A ‘poem of the week’, featuring a poem every week by an Irish poet, would also be a good extension to the excellent e- newsletter that Poetry Ireland regularly sends to subscribers. People ask me, again and again- by they my friends, family members and my editor at The Irish Post– for who I write book reviews and features– “who are the new, young Irish poets and novelists- now in their 20’s and 30’s- who are emerging and gaining a name for themselves?” The very fact that these people have to ask should tell us something. While it’s fair to say that all writers find it difficult to find an audience for their work, for young writers it’s almost nigh impossible. Poetry Ireland, to their credit, have tried to generate an audience for emerging voices. Theo Dorgan, Director of Poetry Ireland from 1989 to 2000, was perhaps the organisation’s most remarkable and forward- thinking Director. By all accounts, Mr. Dorgan was way ahead of his time as Director of Poetry Ireland and, in a broader sense, as someone working in the arts in Ireland. As well as successfully re- branding Poetry Ireland and Poetry Ireland Review, Mr. Dorgan founded the Poetry Ireland Introductions series. Now in its 25th year, the series offers a paid reading to poets who have a track record of publishing poetry in magazines and journals and poets who are preparing a first collection of poems. Every year, Poetry Ireland select twelve poets for the series, some of whom have included Patrick Chapman, David Wheatley, Dave Lordan, Nessa O’Manhony, Enda Wyley and Kimberly Campanello. However, while the series has brought no shortage of household names to the poetry reading public in Ireland, an equal amount of those poets selected each year have found themselves resigned to the “where are they now?” file. There are, perhaps, too many poets selected each year. Furthermore, Poetry Ireland has done little to feature the selected poets beyond the reading. In whatever small way that I could, I tried to generate attention for those poets selected for this year’s series by interviewing some of those poets ahead of the series. My suggestion for the Poetry Ireland Introductions series? Select eight poets each year and include an interview with each poet and two poems from each poet in each issue of Poetry Ireland Review during the calendar year. Whether it’s the Irish, British, or American poetry world, the mainstream media has characterised poetry as cliquish and blighted with bitter jealousies that leak out during post- reading pints. What’s more, poetry has been dogged by allegations of cronyism and bias. To quell any possible allegations of cronyism and bias- some of which may be with foundation in the truth, some of which may be mere speculation verging on conspiracy theory- Poetry Ireland, as a publicly funded organisation, has a responsibility, I feel, to account for how and why appointments are made. An extension of this transparency would be to involve the poetry reading public in Ireland in how events are shaped. All Tomorrow’s Parties, the British- based music festival that has been curated every year by numerous bands and artists, made an admirably democratic move in 2007 when it announced that the second weekend of the festival would consist of a line- up that would be curated by both ATP and the fans who had paid- up for a chalet ticket for the weekend, and who chose acts for the festival online. On behalf of ATP, it was a show of trust towards those fans who had supported the festival; it was a way of giving something back to loyal fans. Similarly, those who travel distances to poetry readings, launches and festivals; those who take books from their bookshelves and carry those books with them to poetry readings to get those books signed by visiting poets; those who take a weekly trip into Books Upstairs to buy from the College Green bookshop’s wonderful selection of magazines and journals; those who scour the second- hand section in Chapters on Parnell Street; those who are the lifeblood of what Poetry Ireland stands for and what Poetry Ireland does…these people should, in some way, be included as to how the organisation moves forward. There should be, I feel, more dialogue between those in Poetry Ireland’s Kildare Street office and those on the ground, who continually support what it is that the organisation does and have done for many years. What it really needs is a location that is accessible to the public. Dublin Castle [where Poetry Ireland’s office was based at the time] is a wonderful space but you can’t just walk in. There’s a great collection of books there but they’re just not seen by people. In Poetry Ireland’s defence, there have been ongoing moves for ten years now to find a way to finance a building where events and readings could take place. It sometimes looks like that’s never going to happen, but maybe it will come right. Where, oh where, will the money come from, I hear you ask. Surely a poetry organisation such as Poetry Ireland is on a shoe- string budget? Well, not quite. PI’s healthy financial situation is down to a generous grant from the Arts Council, with an award for this year of 325,000EUR- a drop of 10% on 2012. Overall, PI’s funding from Merrion Square is down 19% since the peak of 2008, but this compares favorably with most other Arts Council clients, many of whom have been hit by reductions of 30% an more. Poetry Ireland has also recently benefited from the sale of The Great Book of Ireland (Leabhar Mór na hÉireann), which was acquired by University College Cork for €1million. According to The Journal, The money paid by UCC will be split equally between Clashganna Mills Trust, a charity working for people with disabilities, and Poetry Ireland/Éigse Éireann, the national poetry organisation. When I was a student at Manchester Metropolitan University’s Writing School, Michael Symmons Roberts, my personal academic tutor, was- and still is- heavily involved in The Rosamond Prize. The Rosamond Prize is an annual collaborative project between MMU and the Royal Northern College of Music. Named after the street that runs between the two institutions, The Rosamond Prize brings together MMU’s poetry students with the RNCM’s composers, in the hope that collaborative partnerships will be formed. If MMU and the RNCM can forge such a partnership, why, then, is it unthinkable that Poetry Ireland could work with, say, the Royal Irish Academy of Music and launch a similar prize? Such prizes and cross- discipline collaborations inject artistic energy into a city, which, lately, has been severely lacking in Dublin, it’s fair to say. Some years ago I participated in an excellent poetry workshop, led by Pat Boran. Among the many topics of which Mr. Boran spoke was the culture of poetry events and readings in Ireland; of making poetry more accessible to the public. He argued that poetry needed to get out of the libraries and, of course, he was right. Yes, there was an attempt to emulate the London Underground’s Poems on the Underground series with the Poetry on the DART initiative in 2009. As I’m not a regular user of the DART, I can’t say whether or not those poems are still featured at the stations and inside the carriages. 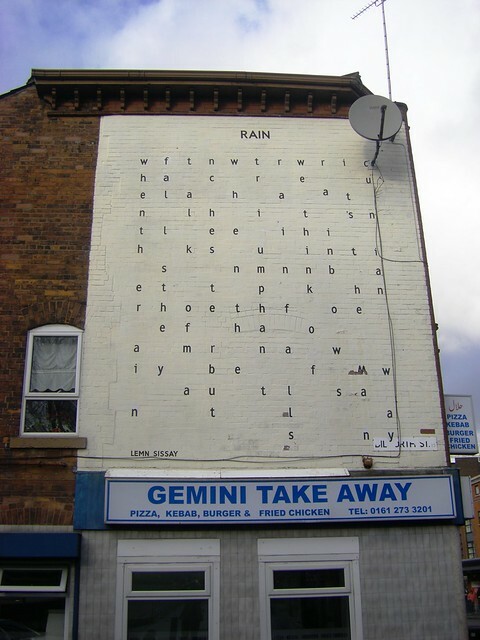 In Britain, poets have been commissioned to write poems that are featured in public spaces, such as Lemm Sissay’s mural poems: ‘Rain’, which is featured on the side of a building on Manchester’s Oxford Road, and ‘Hardy’s Well’, which is featured on the side of a Manchester boozer of the same name. Similarly, Simon Armitage has had his poetry carved in stones along the 47- mile trail from Marsden to Ilkley, in his native Yorkshire, as part of The Stanza Stones Trail. Again, I don’t know of any reason why we shouldn’t celebrate our contemporary poets with such commissions; why Joseph Woods’ ‘A Carvery Lunch in Louth’, for example, shouldn’t be painted as a mural poem on the gable end of a pub in Drogheda; why Conor O’Callaghan’s ‘East’ shouldn’t be carved into standing stones placed anywhere on the Louth coastline, which he celebrates in his 1999 collection, Seatown; why Richard Murphy’s ‘The Cleggan Disaster’ shouldn’t be featured at the pier and harbor of Cleggan, Co. Galway. All of these poems, after all, are public property; they belong to us, now. Like paintings in a home, we should hang our works where our visitors can best appreciate their beauty, their splendor, their richness. Poetry Ireland is a necessary arts organisation that we are lucky to have in Ireland. I do feel lucky to live in a country, which, by and large, does value our high standing in the world of literature. Like all organisations, however, there are things that we all wish were done a little differently and I think such debate on such organisations is, ultimately, to the benefit of us all. As I have clearly stated: I don’t claim to have all the answers. This post is an opinion piece with suggestions. I do think that it is important to stimulate a healthy debate about what kind of culture of poetry we want in this country. Again, I warmly wish Ms. Kennelly all the very best in her new role as Director of Poetry Ireland; her experience in arts management is staggering. If you have any thoughts on any of the above, please comment on this page. Some interesting questions, thoughts, ideas, here. It will be interesting to see what changes, if any, a new broom brings! Delighted to hear your great suggestions on the Introduction Series Philip – I was part of it back in 2009 and although it’s a lovely thing to have on my CV all it really ended up being was a reading for friends and family! A commitment to actually publishing some of the work (with the obvious caveat that these are emerging writers and so are still developing their skills) would be fantastic.